Make sure the prostate supplement you take passed our quality review and is right for you! 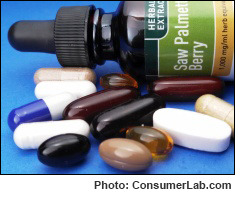 Can supplements with saw palmetto improve symptoms of BPH (benign prostatic hyperplasia)? How about beta-sitosterol supplements? Can such "prostate supplements" help with prostate cancer? Many commercials and websites would like you to believe they can do all of these things. As explained in this Product Review, certain ingredients may help in the treatment of BPH, but evidence suggests that others won't. And none of these supplements seem to prevent prostate cancer. What's more, our testing found supplements which don't contain all of the saw palmetto they claim or provide doses which are much smaller than suggested by experts. Certain products also appear to violate FDA rules for what should (and should not) be on labels. Fortunately, our tests also identified products with ingredients that can help with BPH, are accurately labeled, break apart properly, and are free of heavy metal contamination -- a concern with plant-derived ingredients.